Download a PDF of the Flatwater Metroplex final report here. Download a PDF of the 34-page Envisioning Regional Design report here. The term “Flatwater Metroplex” refers to a region roughly defined by 60-mile zones encircling Omaha/Council Bluffs and Lincoln, a complex, interconnected mix of urban and rural communities that include three major cities and 119 towns of more than 400 people. Home to fragile ecosystems crossed by two major rivers, its rolling hills and broad valleys hold some of the most fertile farmland in the country. About 1.2 million people live in the Metroplex – a population projected to double in 40 years – and communities large and small are already facing challenges resulting from this rapid growth. Through the generous support of the Nebraska Environmental Trust, the Joslyn Institute and partners launched two three-year initiatives under the banners of the Sixty-Mile Radius Study (SRS) and the Nebraska/Iowa Metroplex Indicators Conference (N/IMIC), respectively, to engage public, private, rural and urban stakeholders in a regional dialoge to help shape the environmental future of the Flatwater Metroplex. These initiatives resulted in a host of activities aimed at increasing public awareness of regional growth patterns, beginning with the initiation of an educational process to address growth-related issues. The Flatwater Report and Envisioning Regional Design Charrette Report are just two of the many resources resulting from this rich process. In 2001 The Bureau of Business Research (BBR) at the University of Nebraska, Lincoln presented to the City of Omaha a startling report, “Omaha Area Projections to 2050”. The report stated that in the projected time frame, the Omaha area is expected to grow by 69 percent. By 2050, the Omaha metropolitan area could be host to a population of just under two million inhabitants. Given the disjointed nature of cross-jurisdictional cooperation in the area, the BBR finding posed serious consequences for the region’s future quality of life and the well-being of Nebraska’s natural systems if greater efforts to prepare and educate area stakeholders were not taken. It was with the BRB report findings in mind, that JISC applied for initial funding from the Nebraska Environmental Trust Fund. Later that year, NETF awarded the Joslyn Institute a three-year grant, in partnership with the cities of Omaha, Lincoln, Council Bluffs, the Governor’s Office and the Natural Resource Districts, to conduct educational programs and research activity about regional planning in an area within a sixty mile radius of Omaha. The work began in the summer, 2001, with a conference, the first of several, comprised of communities and civic leaders within the Southeast region of Nebraska. The grant enabled JISC to review public policy assets, deficiencies, and alternatives; facilitate scenario-planning workshops; and identify potential regional indicators of sustainability. This extensive study included comprehensive assessments of more than two dozen city and county comprehensive plans, a regional polling survey, and a number of lectures, forums, meetings and workshops used to identify and disseminate key growth issues, such as low-density sprawl development, and their impacts on the environment and quality of life. The educational program informed and educated the principle regional constituencies and stakeholders of the concepts, tools, and the economic and community values which may lead to more effective behaviors and public policies for the management of growth and the preservation of regional ecosystems. The findings of the SRS team, combined with survey results, research and other activities resulted in the publication of the Flatwater Metroplex Report, (download the 138-page PDF here) in 2004. Among other findings, the report recommended the formation of the Nebraska/Iowa Metroplex Indicators Conference (N/MIC). This three-year effort began the process of potential transition from independent, single domain strategies of community planning to a regional, development strategies. In 2005, JISC was awarded additional funding by the NETF to continue the work of the SRS and begin to implement the recommendations of the pivotal Flatwater Report through the creation of the Nebraska/Iowa Metroplex Indicators Conference (N/IMIC). N/IMIC was created as a voluntary, ongoing process to bring together public/private stakeholders and form effective urban/rural coalitions. From the outset the Joslyn Institute and its N/IMIC partners set forth the principle that environmental health can be maintained and even enhanced if communities work together as region, managing new growth through an ecosystems approach. Quality of life in the metropolitan area of Southeast Nebraska will be measured in the future by the level of cooperation between communities, counties and other regional interests. The population of the Metroplex area, defined within a sixty-mile radius of Omaha, is projected to double to more than 2 million by 2050, creating unprecedented environmental and economic challenges that will shape the quality of life for more than 120 urban and rural communities. By far the most intense growth pressures will be on communities, farms and environmental systems near the I-80 corridor between Omaha and Lincoln. Projections show that as many as 230,000 commuters will travel daily into Douglas and Sarpy counties by 2050, creating unprecedented infrastructure and environmental challenges. Coordinate planning through a voluntary set of regional partners. Conduct regular conferences, meetings, and workshops to provide a forum for exchange of information and ideas. Establish an Annual Sustainability Indicators Report to announce progress on goals to regional stakeholders. Identify and publicize examples of best practices to be used as models for creating healthy and sustainable communities. Establish a consensus of the region’s most fragile natural, social and historic environments. Create strategies/mechanisms to protect these environments. Define policies that clarify or limit acreage development, protect rural lands for food production and natural habitat. Coordinate reviews of water-related policies to ensure equitable access to clean water for agriculture, municipalities, industry and wildlife. Encourage energy conservation and alternative energy production through effective planning and green building techniques. Encourage healthy lifestyles and rich living environments with compact, walkable communities. Create food-based, rural/urban coalitions, and foster understanding of the interdependencies of all communities and natural systems. Throughout its three-year operation N/IMIC brought together participants from all walks of life to craft a regional vision for sustainable growth. In addition to monthly meetings by the N/IMIC steering committee, quarterly public forums were conducted on a number of pressing growth issues including water quality and quantity, transportation planning, and land conversion and conservation. A special forum in the spring of 2006 brought together small town mayors and city managers and planners from Ashland, Waverly, Gretna and Blair to discuss the impact of metropolitan and I-80 corridor growth on their communities. Another public forum on the Pflug road development near the Platte River drew standing room only crowds at Mahoney State Park. A signal event in the three-year N/IMIC process occurred in the fall of 2006 with the two-day Envisioning Regional Design Conference at the Stategic Air & Space Museum near Ashland. With the support of the Nebraska Environmental Trust Fund, the Joslyn Institute forged a partnership with the American Institute of Architects and the Nebraska Innovation Zone Commission to stage this unique multi-charrette exercise. Envisioning Regional Design (ERD) describes an ongoing initiative created to address regional growth issues identified by the N/IMIC process. N/IMIC’s diverse membership comprised the core of ERD, which was kicked off in September 2006 with two-conference, one of which featured six charrette teams. The teams, each led by a facilitator with graphic assistance from professional and student architects, were arranged throughout the Strategic Air & Space Museum’s cavernous restoration hanger. Noted regional planner George Crandall of Crandall Arambula (Portland, Oregon) and W. Cecil Steward, President of the Joslyn Institute and ERD director, were co-leaders of the event. Results of the 2007 charrette were presented by noted planner George M. Crandall, FAIA, at the opening of the AIA Central States Conference at the Durham Western Heritage Museum in Omaha. The Five Domains concept provided the platform for comprehensive analysis of the six scenarios outlined below. Downtown Urban Core Center, Lincoln’s Antelope Valley to P St. The central focus of this charrrette will be the ‘P’ Street corridor linking the Haymarket District to the Antelope Vally Parkway. What conditions and attributes will successfully transform ‘P’ Street into the downtown’s primary retail streetscape maximizing retail, housing, and employment opportunities; integrating and enhancing transportation options; and enriching economic, social, and cultural foundations? By 2050 it is estimated that as many as 250,000 commuters will travel from other counties to jobs in Douglas and Sarpy counties alone, leaving many outlying communities struggling to keep up with housing demands and infrastructure costs while coping with the loss of community and culture, farmland, and historic and natural areas. 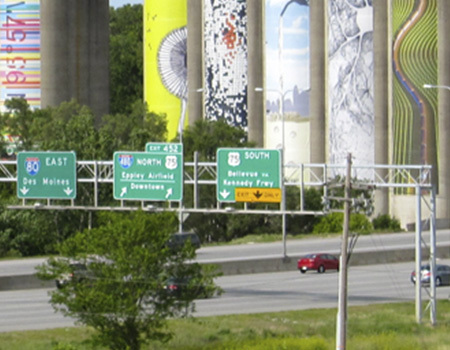 This charrette examines how a small I-80 community can address challenges and opportunities. This charrette examines how this 50-mile, six-lane corridor linking Nebraska’s two largest cities will determine future quality of life for Metroplex communities and ecosystems. Special focus was given to interchanges at exits 420 (Greenwood exit) and 426 (Ashland, Mahoney Park and SAC Museum exit) and to a new interchange at Pflug Road in soutwestern Sarpy County. This charrette explores alternatives to the typical pattern of suburban and acreage development occuring on rural lands near the Omaha metro. Examine how rural lands can offer affordable, sustainable living environments that protect river corridors, natural water sheds and water resources while creating or protecting natural habitat for indigenous wildlife and conserving valuable productive land for continued farming. Examine how the revitalization of a historic four-block, inner city housing project can spark tranformation of the surrounding neighborhood into a vibrant downtown community. This charrette explores opportunities and attributes for sustainable development through the blending of mixed uses, mixed income, and revitalized commercial and housing accommodations. Underutilized malls and big box stores litter the American landscape. More than half billion square feet of retail space sits empty. These places are often underutilized because they are oriented only to cars and are cut off from neighborhoods by high-speed, multi-lane roads. This charrette examines how a 40-year-old Fremont shopping mall could be transformed and revitalized into a transit-oriented, pedestrian-friendly neghborhood center. The Envisioning Regional Design charrette exercise and subsequent reports and activities were lauded by the national office of the American Institute of Architects and incorporated into their Blueprint for America, the primary program of AIA150 that marks the 150th anniversary of the founding of the AIA. The Blueprint program was created to offer citizens in communities across America an opportunity to celebrate their community heritage, address emerging architectural challenges and trends, and find their voices to help make their vision real for beautiful, safe, and livable communities. Results of Envisioning Regional Design were also published by AIA on a searchable geographic database in cooperation with Google Earth.